We slept a second night at Ashley and Trevor's. I had the guest bedroom, while Ueli slept on the couch again. Since it was a work day, our hosts had to work, so we left the house with them. I had arranged to meet with two friends in Tucson whom had couchsurfed with me in LA. We met for breakfast, in a strip-mall diner in north Tucson. Everyone in the restaurant there was at least twice my age and twice my weight. It was sort of depressing to see. But it was great to catch up with some familiar faces, the first "reunion" of this trip! After using some wifi and stocking up on some snacks, we hit the road, passing by what was likely the last In-N-Out Burger that I'd see. Instead of sticking to the 10 freeway, we detoured a bit to see the historic western towns of Tombstone and Bisbee. 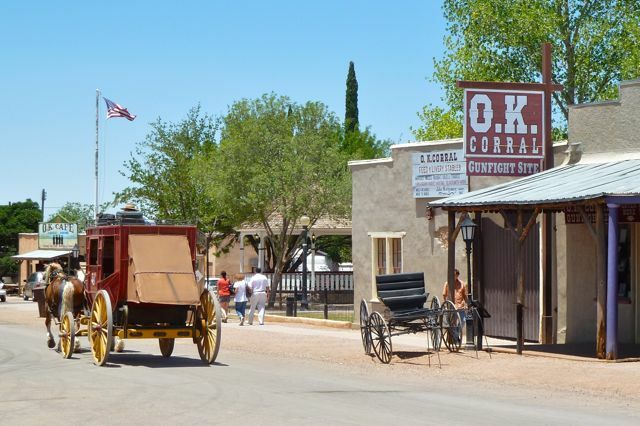 Tombstone is really an old western town, most widely known for the gunfight at the OK Corral. There are about 6 blocks of persevered "old town" saloons and whatnot, and there are actors dressed as cowboys walking around everywhere, trying to sell you tickets to the next "gun fight" show or historic mine tour. In the whole town, there were about 75 tourists, and just as many cowboys. Leaving Tombstone, Ueli took over the driving as we passed under smoke-covered skies from a nearby wildfire and headed south. We were approaching the Mexican border. After passing through a tunnel, the town of Bisbee emerged in the valley below us. Bisbee is a historic mining town, with buildings that look like they came straight from the Universal Studios backlot. In contrast with touristy Tombston, Bisbee is much more like a real, functioning town, with several hotels, stores, and art galleries providing an alternative twist to a purely wild west town. The town center is pleasant to walk around, and it's compact enough that walking up hills is not too taxing. We walked into the local tourist office to get a local map, and as we entered, one of the two middle-aged women exclaimed, "well here comes some youth, dressed in bright green!" It seemed like our visit was the highlight of their day. As we left Bisbee, we drove past a large open-pit mine. The view was spectacular and the rocks tinted in hues of reddish-brown. It was the Lavender Pit. The next town was Douglas, Arizona, right on the Mexican border. We passed through, but realized that we needed to fill up the gas tank, so we asked a pulled-over Border Patrol officer (who looked very much like an "officer Leroy"-type) where the nearest station was. Another hour or two, and we crossed into New Mexico. There was another wildfire burning in the mountains to our west. Not much to mention from our New Mexico leg. We would have liked to have visited the ghost town Shakespeare, but we didn't see its exit (maybe it's a ghost off-ramp). We crossed the continental divide. We stopped in the town of Deming for a light pre-dinner at Wendy's (I just had a chocolate frostee and fries). We drove through Las Cruces and headed toward the Texas border. Soon we were in El Paso, where we headed straight for our couchsurfing host and an unexpectedly memorable night.